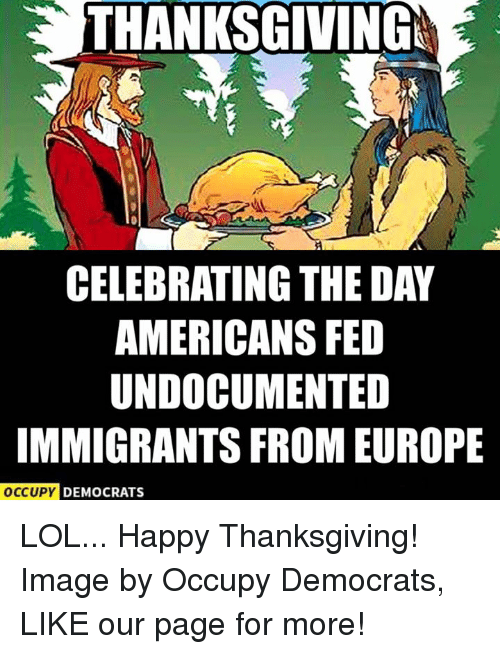 Memes, Europe, and Image: THANKSGIVINGM CELEBRATING THE DAY AMERICANS FED UNDOCUMENTED IMMIGRANTS FROM EUROPE OCCUPY DEMOCRATS LOL... Happy Thanksgiving! Image by Occupy Democrats, LIKE our page for more! LOL... Happy Thanksgiving! Image by Occupy Democrats, LIKE our page for more! Memes, Thanksgiving, and Image: We're baaaaaack! Clarence artist Alen Esmaelian is joining us on Facebook Live to show us how things are going with his awesome Thanksgiving image! Check it out!